Distributists believe property ownership is a fundamental right and that the means of production should be spread as widely as possible. Otherwise we’re faced with centralization by the state, by the few (a plutocracy, the 1%), or corporations (corporatocracy). I’ve understood the concept for some time, but I’ve only just learned from Douglas Rushkoff that it originated in the Catholic church. No idea how I missed that! 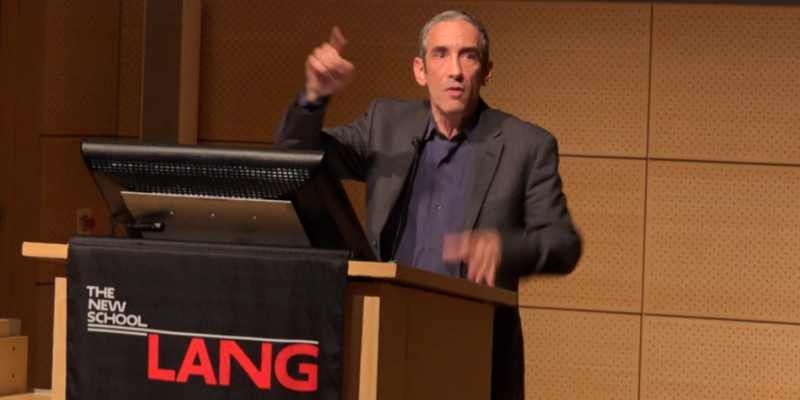 In my opinion, Rushkoff‘s contribution to the Platform Cooperativism conference last week exemplified the core concerns of delegates, and more eloquently than many of us might muster. Platform Cooperativism is distributist, striving to counter the centralizing platform monopolies we’ve seen prevail in recent years, and for anyone familiar with the hi:project’s mission and vision you’ll know we’re intent on facilitating personal agency and distributed participation, so our respective values and aspirations have much in common. The beauty is that, in the real world, as opposed to online, in the real world, human beings have the homefield advantage. We actually do. This is why corporations of the industrial era are so happy to go online because we no longer have the advantage there. We’re not there. We don’t have our flesh, our reality, we don’t have all the stuff, all the solidarity that is created by humans in real space together. So I believe our opportunity, as humans, who want to redirect the economy towards human ends rather than the needs of extractive capital that’s serving nobody is to reboot the economy itself for distributed prosperity. Mr. Rushkoff, if you’re reading this, we’d love to have a deep and meaningful. We think you might just love the human interface project.